Bulgaria appeared on our travels plans at the last-minute. We thought about visiting the country many times before, but it wasn’t on the top of our bucket list. Shame on us!! I’m glad that we changed our travel plan. By the end of May, we decided to travel to Bulgaria, first to discover the top things to do in Sofia, then head to the mountains for a house & pet sitting job. As I learned with a good friend “Life is better when you live spontaneously”, and that what we did. While travelling in Europe we got selected for our fourth house & pet sitting job, this time in the Bulgarian mountains. A new challenge, and we decided to embrace it. Six weeks in the middle of the nature would be a great opportunity to work and explore a new country. When I say new country I mean: new language, new food, new culture… And that was what excited us the most. We knew that Bulgaria is an important country in the Balkans, full of history and tourist attractions, but I didn’t have a clue there will be some many things to do in Sofia. To maximize our experience we took a really important decision: book an organised tour! We looked at the Viator website and found an interesting 3 hours tour called “Food Tasting and Cultural Walking Tour”. Sounded like a perfect option for us, we could try local food, see the top tourist attractions in Sofia and learn about the culture. So we booked it, and definitely it was the best decision we have made. We managed to pin all the top things to do in Sofia and learnt a lot about the city in just one afternoon. Totally recommend it, even if you plan to stay more time in Sofia, do it on the first day of your trip, it´s really worthy. It will make the whole experience in the city richer and easier. Where to stay in Sofia? Hotel, hostels??? That´s an easy question, you should stay at Hostel Mostel. No, they are not paying us to say this, the truth is that we booked three nights there and love it! Ohh, but you don’t like to share dorms? No problem, get a private room and be happy! HOSTEL MOSTEL is a nice huge house close to all the tourist attractions in Sofia, but the interesting part is that the house is hidden behind an ugly building. So don’t be scared of the old facade, open the tiny gate and you gonna be surprised. Of course there are other options of hotels in Sofia. 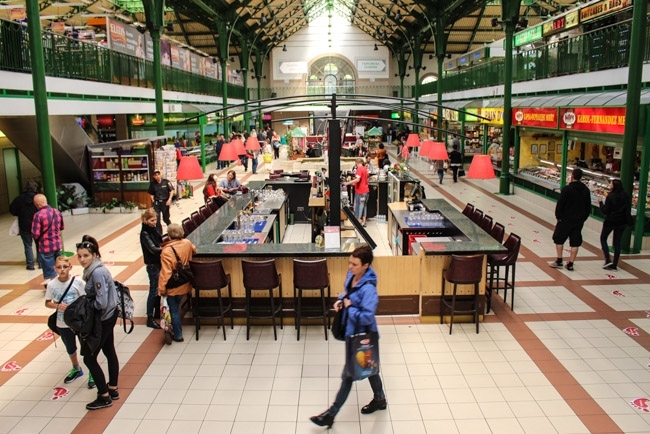 You can find budget hotels, boutique hotels and 5 stars hotels in Sofia. If you rather prefer to stay in a fancier hotel, there are plenty of good options in Sofia. From top brands hotels to family run B&B. To choose the best options we recommend two trustworthy websites: BOOKING.COM & AGODA. What makes the city so interesting? What are the tops things to do in Sofia? There are many reasons why you should travel to Sofia. However, for me the most important one is the history! I’m not talking about boring history, I´m talking about living history. Everywhere you look there is an old mosque from the Ottoman Empire, or even an older Roman Catholic church, or a modern and tasteless building from the Soviet Union period. That is fascinating!! 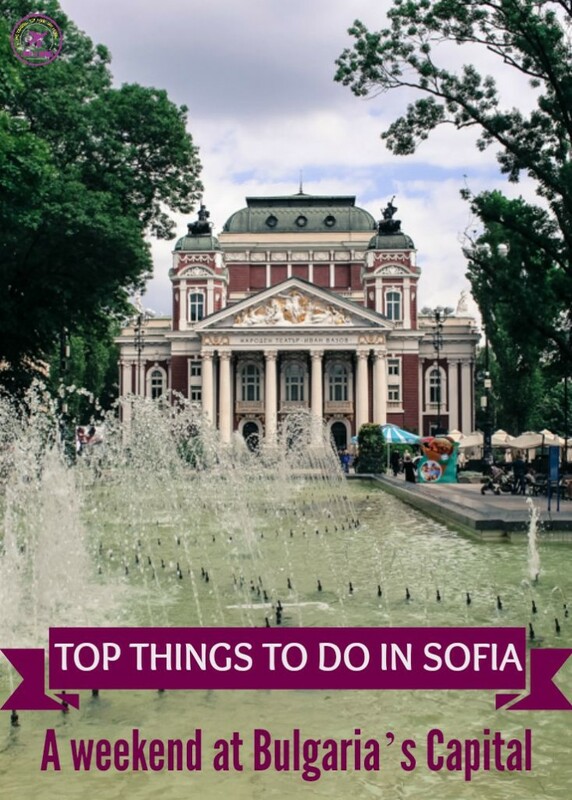 In two days, we managed to explore the city and here are the top things to do in Sofia. Follow the 5 steps and get the most of this incredible city! No one tells more about the history of Sofia than the churches. We can start at St. Sofia Basilica, built during the 6th century. Then go to the St. George Rotunda constructed by Emperor Constantine, the oldest church in Europe that is still on service. In Sofia is prohibited to take photos inside churches, what is really a pity because St. George Rotunda is incredible and has so many layers of history on the walls and ceiling. It might be hard to find the St. George Rotunda Church, it´s hidden between a government building and Sheraton Hotel, in the middle of a courtyard. Surrounded by the ruins of the Constantino palace, the church is the proof that Sofia was already an important city during 4th Century. 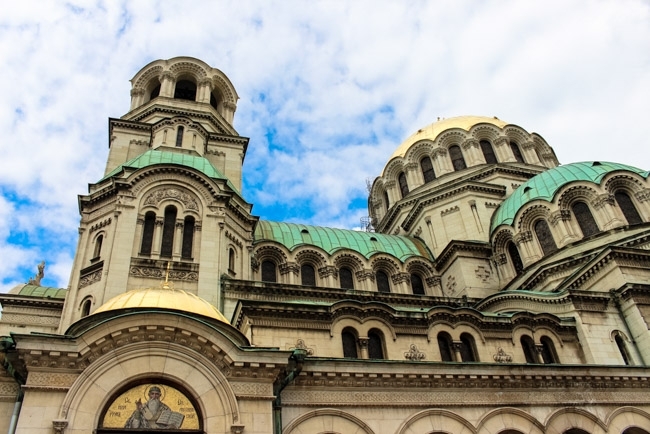 Then you can be hypnotised by the sumptuous Alexander Nevsky Cathedral, that was built with money donated by the Sofia citizens. A symbol of faith and pride with huge domes coated with gold that shines across the sky. 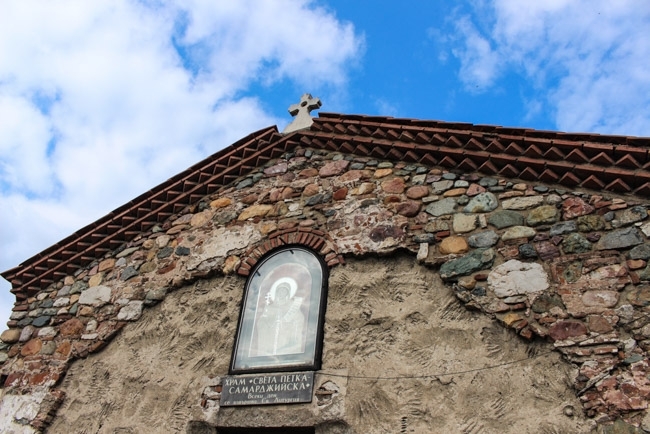 Another incredible witness of the history is the tiny Sveta Petka Sardjiyska, a little church constructed during the Ottoman empire that looks like a normal house but hides a magnificent interior, full of paints and sacred art. A must thing to do in Sofia is to visit the Sveta Nedelya Square, the place where the city was founded. There you can see side by side an Orthodox Church, an Islamic Mosque, a Jewish Synagogue and a Catholic Church. All then sharing the same big square, in one of the busiest intersections of the city. That’s not only history, that´s a true lesson for the present and future. Live in peace in respect, doesn’t matter your faith or where you come from, we are all the same. And that’s how I felt in Sofia. While walking around Sofia try to look down to find the streets made with yellow bricks. That´s a signal that you are in the wealthiest area of the city and also that you are about to see the most beautiful buildings in town. They are not just nice and well-constructed buildings, they are the legacy of the great moment Bulgaria lived during the 19th century. They are also a fine example of Neo-Baroque and Viennese style. 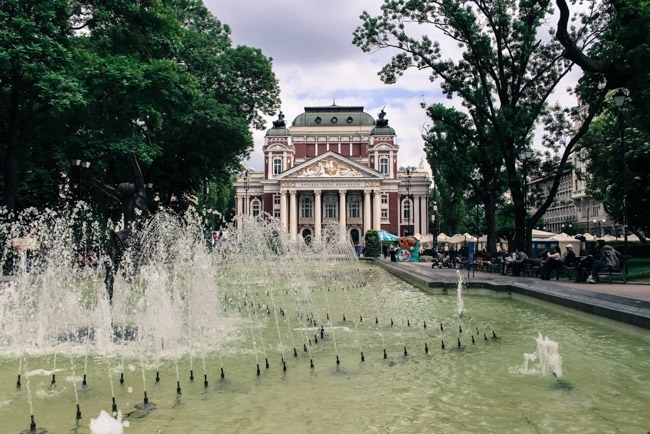 The National Theatre is the jewel of Sofia, an outstanding building surrounded by a beautiful garden. 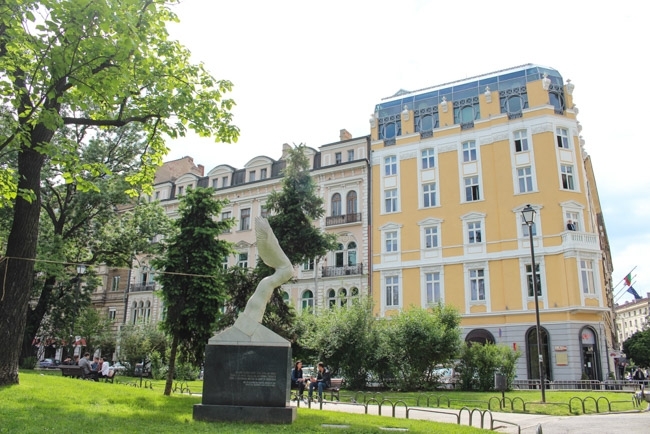 The trip through architecture doesn’t stop here, following the yellow bricks you can reach the Parliament, the National Gallery [former Royal Palace of Sofia], the Party House and many other private buildings that still hold the ornamental facades. Bulgarian people are friendly, we had no problem to communicate with them even don´t speaking a word in the Cyrillic alphabet. But we do have a great smile and that helps a lot. There is no better place to meet people than the parks around town. If you visit all the top attractions in Sofia you will find out that most of them are surrounded by a nice green square, and there you can find a bunch of young people drinking beer or an older crowd talking about politicians and Bulgarian economy. 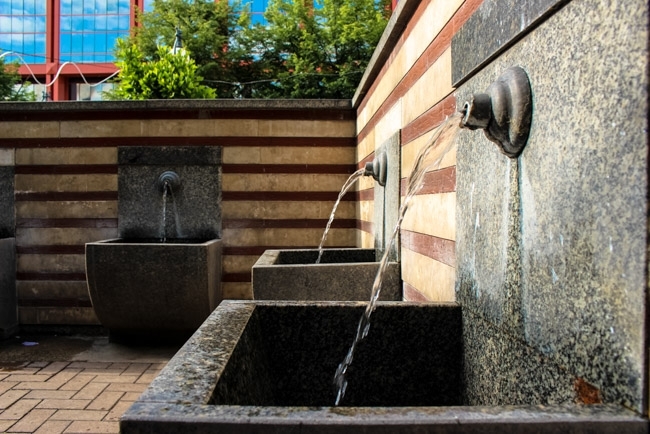 Visiting the parks, you will cross many interesting places in Sofia, one of them is the hot spring water that runs in the heart of the city. You can fill up a bottle and take to your hotel, they say the water is good for the muscles and immune system… It´s worth to try, and it is free. This area is full of emblematic constructions, just beside the hot spring a yellow impressive building catches everybody’s attention, is the Central Bath House built before the World War I. And in front of the bath is located the Banya Bashi Mosque, the only Islamic mosque in Sofia that is still working, and it is also a museum. On the other side of the street, an interesting building caught our attention, not only because of the design, but because of the flavours you can find inside. Now we go to our 4th reason to visit Sofia: Eat! During the walking tour, our guide took us to the Halite, also called Market Hall [open daily for 7am to midnight]. Inside this huge building many stalls selling fresh veggies and fruits, home-made pastries, olives, the famous yogurt and cheese. There is no way you wouldn’t love it. Apart from the food the construction itself is beautiful and everything is so clean and organized. We love it! In Bulgaria the history, the architecture and the food have influences from other countries. From the neighbours on the Balkans, from Turkey, Greece and Russia. As a result, a great mix of flavours and recipes that makes me hungry! Meat lovers will be happy in Sofia, in every corner there is a BBQ restaurant serving pork chops, hamburgers, chicken legs and mixed skewers. Still talking about food, one of the top things to do in Sofia is to visit a traditional Bulgarian restaurant and try the “mezze”. We went to a place called Pectopaht, near to the Lions Bridge and tasted a bunch of dried meat delicacies that were followed by Bulgarian wine. Cheers to great sausages, hams and salami! 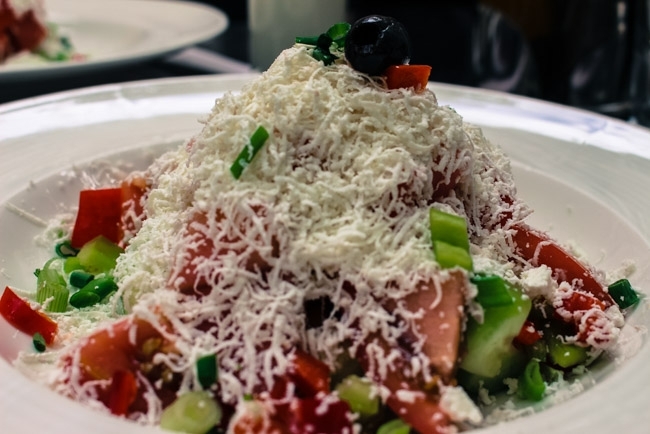 For those who are not big fans of meat, there is heaven in Bulgarian food menu and it´s called Shopska Salad. We went to nice and well designed restaurant named Art Club Museum to try Shopska, and it was delicious. Tomatoes, crispy cucumbers, red and green peppers topped with grated white cheese… I just added olive oil and the dish was ready to eat. This time the local drink was Ayran, a beverage made of yogurt, water and salt, a weird mixture that turned out to be refreshingly good. So far, that was definitely my favourite meal in Sofia. I know, I know… You might not be a party people like us, but if travel to Sofia you must go out. The nightlife in Sofia is vibrant, you can find bars, pubs, restaurants and clubs for all tastes, playing all types of music, with a local or a foreign crowd. You can choose, and that’s the best part. When I talk about nightlife, I also want to highlight the cultural life in Sofia. Theatres, international concerts, museums… The city never stops, it´s always something going on. Walking around you will find many posters of things to do in Sofia, plays and movies. Choose one and experience something really local. Now that I have shown you the top things to do in Sofia and five really good reasons to travel there, it’s time to talk about practical stuff. Here are some precious tips on how to arrive in Bulgaria, how to get around Sofia and nice hotels to stay. Bulgaria is on the east part of Europe and Sofia can be reached by train, bus and flights. We are big fans of train trips and the good news is that you can use your Eurail Pass to travel to Sofia and around Bulgaria. Only one ticket and you can explore the Balkans countries with a flexible schedule. If you have spare time buses can be another option, but keep in mind that the timetable of the local buses is not so reliable. As we were in a tight schedule, we chose to fly from Italy to Bulgaria. We found a good flight deal searching on Skyscanner.com. We use the website to compare fares and pick the best date/price for us. Just be aware that Sofia airport has two different terminals and only at the Terminal 2 [the new one] has a connection with the Metro. So if you are flying with a budget airline the chances that you will arrive at the Terminal 1 are big. So before panicking I will give you a precious instruction: get your bags, leave the arrival area by the right side and walk until the next building, there you will find a shuttle bus that will take you to the new terminal [the bus runs every 20 minutes]. You don’t need to pay for the ride, either you don´t have to trust the unofficial taxi driver that will insist on take you to town for a “friendly” price. Or, from outside the Terminal 1 you can take the bus 84 to the city center. How to get around Sofia? That is the easiest part of the trip! Sofia is the capital of Bulgaria, but it´s still a medium size city. The public transport system has trams, metro and buses, but I would say that you rarely need to use them. Most of the top things to do in Sofia can be reached by a short walk and you will need the metro or the tram only to go to the airport, bus and train stations. Even if you don’t need to use the metro, a visit to Serdica station at Sveta Nedelya Square is a must thing to do in Sofia. It´s not only a station, it´s a museum. While doing the excavations for the new line they found many ancient ruins and kept some of them inside of the metro. Super Cool! Now that you already know how to get to Bulgaria, the best options for accommodation in Sofia, how to move around the town and the top things to do there. I think the only thing missing is the dates of your travel!! Learn with us: Live Spontaneously! Reach to this amazing city for a weekend getaway or for a long holiday. 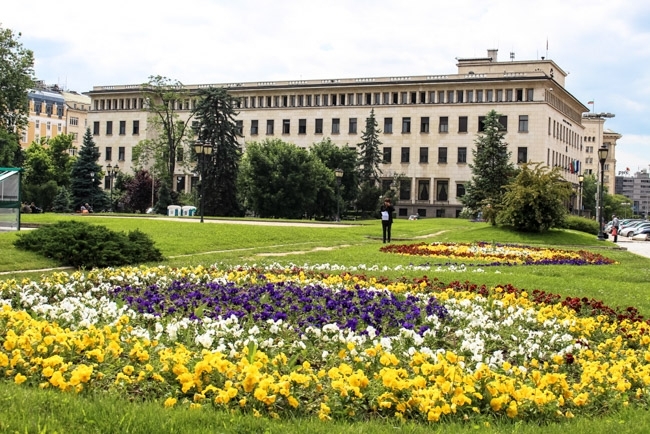 There are so many great things to do in Sofia and around town that you will be surprised. Have we inspired you to travel to Bulgaria? Would you travel to Sofia in summer or winter? If you like freezing temperatures and snow fun here is everything you need to know about ski holidays in Bulgaria. Choose your favorite season and have fun! We want to say a big thanks to Viator for sponsored our Food Tasting and Cultural Walking Tour in Sofia. Despite who paid the bill you got our true opinion and feeling. We will be in Sofia, Bulgaria for the first week of November. I saved this! But how cold will it be then? Glad to know that you coming to Bulgaria! 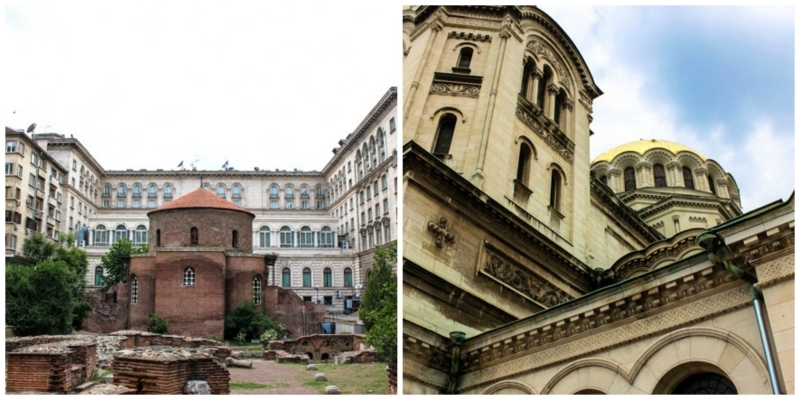 Sofia has never been on my list, but I’m liking its historical eclecticism! You guys look like you did loads in 2 days. Definitely fancy following in your footsteps! There were two super busy days, but totally worthy! Sofia is really interesting, it has an edge, something different from the other European capitals. I love taking food and walking tours around a new city. There’s no better way to get in touch with the local culture. The Shopska salad looks incredible. Thanks for the introduction to Sofia! And I agree with you, there is no better way to learn the culture than tasting a good food! Thank you for the accommodation tips, it’s a long long time since we’ve been to Bulgaria, but would love to go back with our kids. The hostel it´s a really nice place, and I think the kids would like the atmosphere there too! I´m so happy that you liked Sofia, hope you can make your way to Bulgaria soon. It´s a lovely country, the food and the people are amazing too! 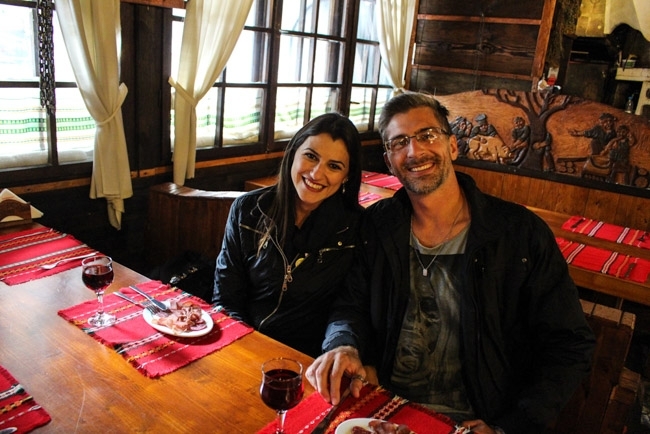 I would definitely add Sofia to your itinerary… Also the countryside of Bulgaria, the mountains are beautiful! Great post and suggestions. I have to admit that Bulgaria had never been on my ‘must see’ list, but after starting to follow travel bloggers while living in Europe, my list is much longer and now includes Sofia! Your photos are wonderful! I prefer traveling in the spring and fall to places inland, saving the summer for beaches and islands! Heavyweight clothing in the winter always makes me reluctant to do too much traveling far away during that season! But regardless to the season, Sofia is definitely a city to visit! Sofia looks like a lovely place to visit. I would also enjoy the food and culture tour. Looks like there’s quite a bit to taste and see. For sure there are lots of things to do, see and taste in Sofia. We manage to explore the city in a weekend, but totally recommend you to stay a little bit more! I was just there and I stayed at the same place!!! I loved Sofia, I found it so charming and laid back and walkable. I’m so glad you told the story of the yellow bricks! I’m glad to hear that you enjoyed Sofia too! Glad to know that we inspired you to visit Sofia! Bulgaria is an interesting and beautiful country! So glad that you liked the post and got curious about Sofia!! Put Bulgaria on your travel radar, I´m sure you will enjoy it! I was taken to Bulgaria as a baby and don’t remember it at all, but this has ignited my curiosity! Thanks for stopping by Dannielle! I’m sure Bulgaria has changed a lot and it is worth a new visit! Very cool, I have been interested in Bulgaria since I had to do a presentation on the country a year ago 😀 It’s interesting to see how ‘normal’ Sofia seems even after some protest years in the past. Very nice and informative post, thank you! Sofia has passed by a lot of political turbulence, but it keeps its charm, it’s a beautiful city and full of personality! I have been to Bulgaria before, but not to Sofia. I have a friend that lives there who I would love to visit. Thank you for giving me more reasons to go! If you go to Sofia, don´t forget to try the food! Amazing! I’m always so amazed at how you guys always have the energy to party! I agree that through churches (or mosques, or synagogues depending where you are), you can get a real feel for the history of a place, but the food and the people are usually the highlight! Can’t wait to get there soon! I´m happy you already visited Sofia, most of the travellers don´t give value to Bulgaria and it´s such a beautiful country! What a lovely place! The yellow brick road is such a cool tip. I know the kids would especially love that. Thanks for the inspirational post…I am now daydreaming of a visit! The yellow brick road is a must visit place in Sofia, and most of the people just don’t realize how nice it is and how meaningful those roads are. Awesome post! Love reading about new cultures and learning about new cities. Thank you for sharing! I would love to house and pet sit! Interesting what you post about hostels! Not one of my favorite places to stay, but I would almost try them, after what you said. I´m glad you are considering to stay in hostel. I know it´s not the most comfortable and luxurious place, but has a lot of character and you can meet awesome people while travelling. If you are interested in house & pet sitting, we wrote a nice article about how to do it and the amazing benefits of be a house sitter. I’ve not yet been to Eastern Europe, but you’ve made Bulgaria look quite enticing! And you’re right in following spontaneous opportunities. Some of my best trips have been as a result of a spontaneous decision. But I really happy that we did it! There are also so many other wonderful places, the Black Sea coast, for instance, is also a must see – Nessebar, Sozopol..
We are so glad if your comment! Especially because you are a expert about Sofia and Bulgaria! We had a great time in Sofia and till now we didn’t have time to explore further because of our house sitting responsibilities. But definitely we´ll take a weekend off so we can enjoy the Rila Monastery! Wow, lovely pictures! I loved your entry. 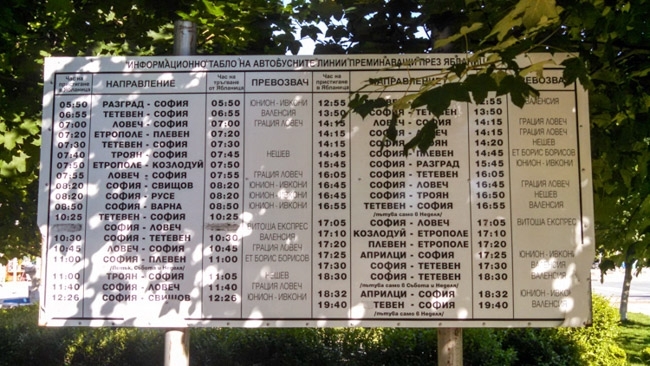 Last time I only drove through Bulgaria but seeing this I definitely need to make a stop and go to Sofia soon. You should come to Sofia and enjoy the city!! 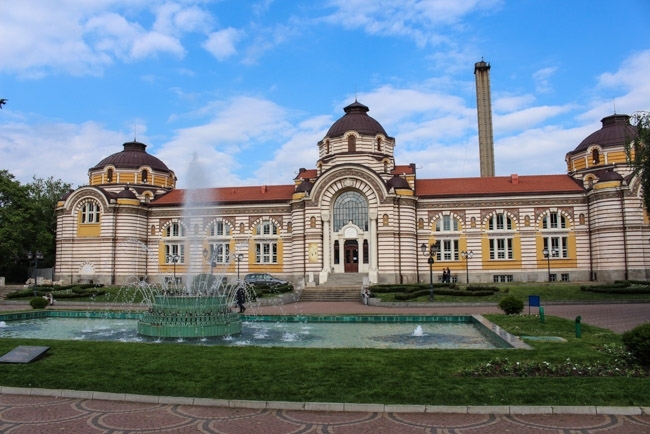 Especially with you can by car, there are so many things to see and do in the city and around Sofia! Sofia looks to be a beautiful city. I could do with some of the Shopska Salad right about now. I´m missing Shopska salad!! And the Bulgarian yogurt too! Thanks for introducing ANOTHER destination for our ever-growing bucket list! Sofia looks amazing and I’d love to get there one day! 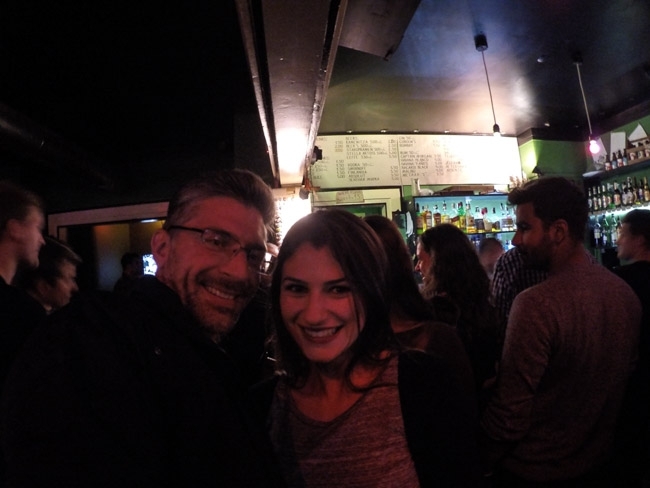 So happy that you liked Sofia and put it on your travel radar!! It´s is a very interesting and beautiful city, worth the visit!! Sofia is my ‘last minute’ itinerary too for a longish weekend in April. My daughter and I will be there for 4 days. Thanks for this comprehensive post! So happy you liked the post! Enjoy Sofia, I believe April is a beautiful season to visit the city. Sofia, and Bulgaria in general, are indeed a great destination for anyone, interested in history and culture. It was a pleasure to read your article. As you said, Sofia is a great travel destination and sometimes underrated by many travelers. Loved this post! We are heading there in a few days, but we only have one day before we head to Bansko! What do you suggest we do?